I am blogging while jumping up and down to give candy to the trick-or-treaters. We never had more than 2 or 3 at our old apartment, so I am in LOVE! We aren't allowed to celebrate Halloween at school. We aren't even allowed to mention the F word. FUN! Get your mind out of the gutter, okay? If we do, we might get arrested by the fun police or something. I hateeeee this rule so much! 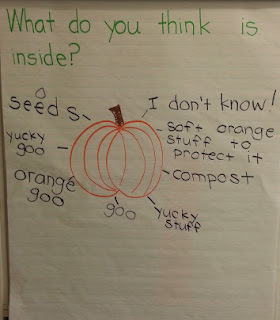 I do, however, sneak in some pumpkin themed math and science activities. Hey, it's pumpkins not Halloween (do you hear me, fun police?). I apologize for the quality of these pictures... apparently my phone hates low lighting! 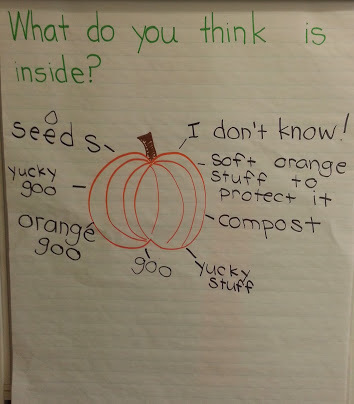 First we passed around a pumpkin, felt how heavy it was and guessed what might be inside. I loved some of the responses :) Tomorrow we will cut it open and check our predictions. 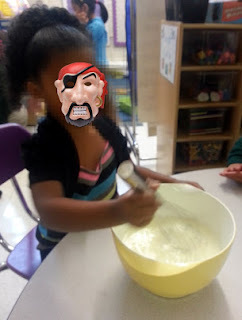 Next we made a pumpkin snack. First we made vanilla pudding. I loved the vocabulary my ELL's learned from this! After it thickened, we spooned some pudding into cups and topped it with a dollop of pumpkin pie mix. They stirred it up and tasted. Yummy! Last we made a graph. The little ones made observations about the data, then we numbered each post-it. They said things like "More people liked the pumpkin because there are two lines, and the people who didn't like it only had one line" and "There are five in the no spot, and a lot more in the yes spot" (that was before we counted). Pretty good for four year olds! I can't wait to do more pumpkin activities tomorrow! 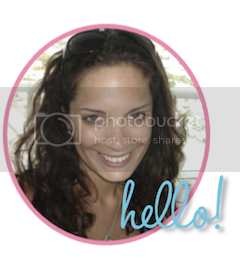 I just found you while searching "friendly letter kindergarten". Yippee!! I'll post our results and link back to your post. I'm your newest follower! 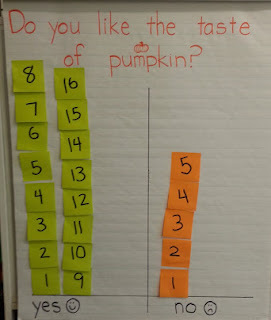 My kindergartners enjoyed pumpkin experiments last week, too. We are focusing on a patriotic theme this week. I teach at a Christian school; we don't do Halloween either. But that doesn't stop a 5-yr-old from being obsessed! I'm looking forward to Thanksgiving!